The two-day GST Council meet, which is being held in Srinagar decided on fitment of 80% to 90% goods and services under the four tax slabs. 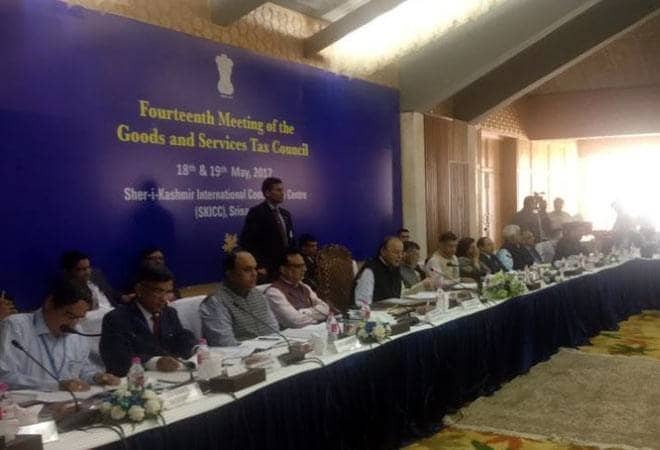 The first day of 14th GST Council meet to decide fitment of commodities in various tax slabs under the Goods and Services Tax concluded in Srinagar's Sher-e-Kashmir International Convention Centre (SKICC). On the first day, the GST Council categorised 80 to 90 per cent goods and services under the four tax slabs stipulated under the GST Act. Essential commodities have been placed in the lowest tax bracket, that is five per cent. Rates close to the exisiting incidence of excise duty coupled with VAT or service tax has been considered to be the rate under GST. The key GST Council meet saw the presence of finance ministers of 29 states and three union territories who will hold the final deliberations on the biggest tax reform since independence, the Goods and Services Tax (GST). The venue of the GST Council meet was chosen months ago when J&K Finance Minister Haseed Drabu hosted a lunch feast for state finance ministers and delegates in Delhi. The 12-course meal, which included a wide array of Kashmiri Wazwan delicacies helped the GST Council members break the ice and build consensus over sticky GST issues. Chaired by Arun Jaitley and the meet was attended by around 150 dignitaries, including Finance Ministers and Finance Secretaries of all the states. The choice of the venue for this all important two-day meet is being viewed as a political statement by the government as it comes in the backdrop of a restive Valley, marked by violence and protests in recent months. The GST Council had earlier agreed on a four-tier tax structure -- 5, 12, 18 and 28 per cent -- along with a cess on luxury and demerit goods such as tobacco, pan masala and aerated drinks. The cess will be used to compensate the states for revenue loss arising out of the GST implementation in first five years. The rates fixed during the meet in Srinagar will be charged from July 1, the scheduled date for rollout of GST which is India's biggest tax overhaul since independence. According to state police officials, around 1,000 security personnel have been pressed into service for sanitising the conference venue and the hotels the officials will be staying. Another 400 men will be deployed for the security of the delegates. In April, the Lok Sabha had passed Goods and Services Tax (GST) bill. The historic tax reform came a step closer to meet its July 1 target of rollout, with the Lok Sabha approving four supplementary legislations. The legislations were passed after negation of a host of amendments moved by the opposition parties.